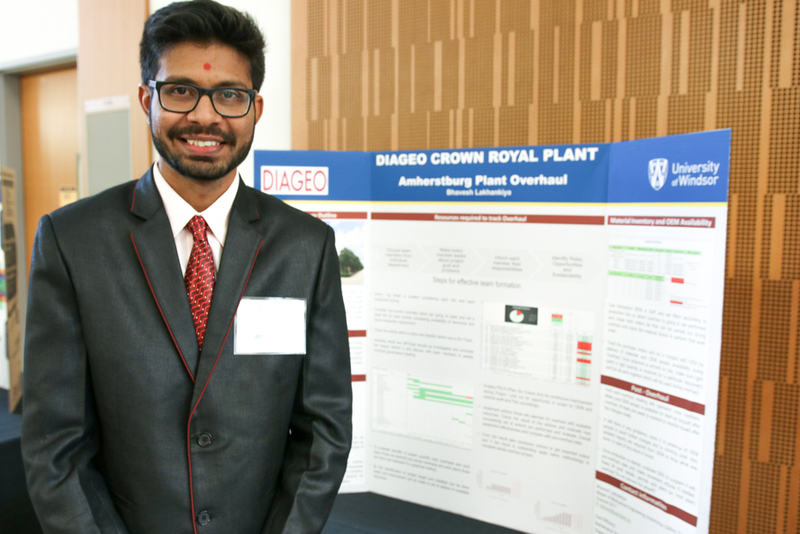 M.Eng student Bhavesh Lakhankiya completed an internship at Diageo Canada Inc. in Amherstburg, Ont..
Lakhankiya was among eight students in the master of engineering in mechanical engineering with the automotive option program to present posters on their co-operative education placements in the Centre for Engineering Innovation on Friday. Lakhankiya was part of a team at Diageo that performed an overhaul which sees the plant shut down for major equipment maintenance. He would track resources like mechanics, operators, and materials to determine a timeline for the overhaul as well as track work orders and purchase orders. The Diageo plant in Amherstburg facilitates bottling and packaging of Crown Royal whisky. For Darpan Patel, the highlight of his co-op at Ford Motor Company of Canada was the hands-on experience. “I was able to learn everything about engine components, their functions and when I got this co-op I got the chance to disassemble the engines on my own completely,” Patel said. Patel said during his co-op, he worked with the quality team and disassembled the warranty claim engines. “I conducted a root cause analysis to find the potential causes of the warranty failures,” Patel said. His work focused on the issue of engine knocking and led him to examine uneven rod wear caused by cap-shift rods and scuffed piston skirts. The co-op is optional for M.Eng – mechanical engineering students and provides them with an opportunity to work in an automotive related company during one semester of school. For more information, visit www.uwindsor.ca/professional. 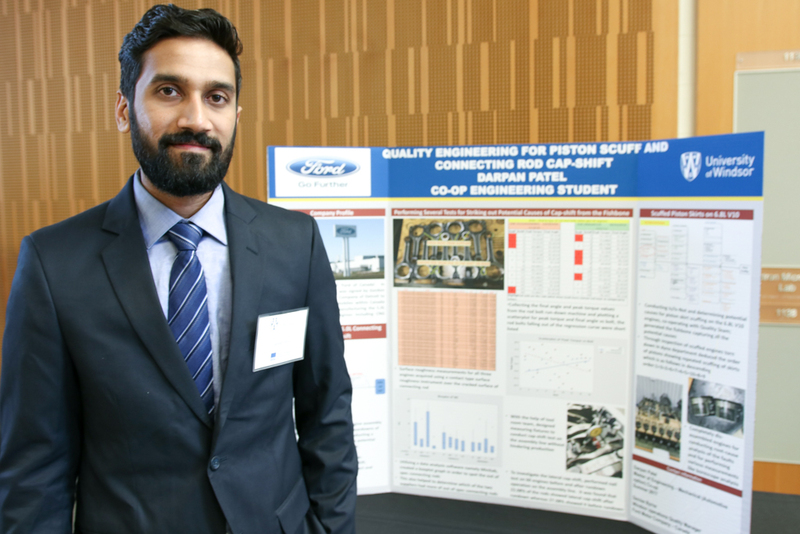 M.Eng student Darpan Patel completed his co-op placement at the Ford Motor Company of Canada.